One of the most abundant fish is the tilapia and there are also many species that are available in the wet market. In the Philippines I think there are only 2 to 3 species that are sold in wet market and supermarket. The black colored which thrive in salt water and the light grey tilapia in freshwater. The black one is usually favorable because it doesn’t have the muddy taste the most fresh water fishes has. Fresh water tilapia sometimes has strong muddy smell and taste (lasang gilik) and that is when the fish is caught from dirty water. But you can be sure if the tilapia is bred in fish ponds and specially the variety “tilapiang pampangga” is I think the best tasting tilapia I’ve known. This sweet and sour dish is very simple to make. Just sauteing the vegetable and spices, simmering the condiments and other ingredients to make the sweet and sour sauce then pouring it over the fried tilapia. 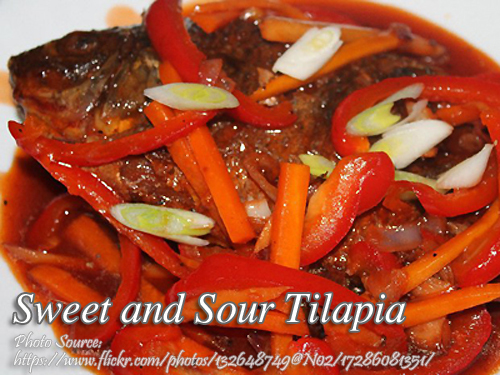 This is a sweet and sour tilapia recipe. The fish is fried first then combined with a sweet and sour sauce made from carrots, bell peppers, onions, garlic, catsup, ginger and cornstarch to thicken the sauce. Wash in running water to clean the fishes and rub with salt. Set aside for at least 15 minutes. Fry the tilapia until golden brown then transfer to a colander to drain excess oil. Transfer to a serving dish. In a saucepan melt butter and saute garlic, onion and ginger until cooked. Add in the carrots and stir fry for a few seconds then add in the red bell pepper. Pour the tomato ketchup and cornstarch, stir cook in low fire for a few minutes. Add in the brown sugar and season with salt and pepper. Adjust the amount if necessary. Add some water if the sauce seems to thick and adjust to achieve the perfect consistency. Pout the sauce over the fried tilapia and garnish with green onion. Serve hot. Hi Sabrina, I’m glad you like the recipe!